Imagine what would happen if you could write a story or a conversation, plan your decisions in advance, decide the leaders, clients and vendors you wanted to work with in advance and then in a couple of months, weeks, days or sometimes even hours suddenly notice these ideal people talking to you just as you had scripted or preplanned? How have clients used Scripting For Success? Clients have SuccessScripts to create win/win conversations and get mentally and emotionally aligned with the best outcome. Some victories have included Ruth’s work has helped clients avoid lawsuits, overcome family drama, get a tax auditor to apologize for an IRS accounting error, distant relatives have unexpectedly gifted a four year college education and room and board. Ruth’s clients have had their clients suddenly pay outstanding bills with out any direct communication. Unexpected gifts have included, a generous donor paid medial expenses in full. Exes suddenly started cooperating. Ruth’s clients suddenly got their dream jobs. Coworkers and employees suddenly got into alignment with the company mission. Employees suddenly got unexpected pay raises and better projects and accounts…to name a few Success Script victories! Once Ruth has helped them shift their focus from stuck, complaining, wheel spinning ruts to her clients and students’ ideal win/win results, Ruth helps them co-author a Success Script which is a specifically worded story or statement that generates an instant energetic connection inside their heart. It’s that jolt of energy that notifies the mentor and subject if they are in alignment with the decision or the words have to be shifted and tweaked for optimum focus and energetic attraction! Then her clients read the Success Script, not to fix anything, just to feel good! The Success Script is working when the user starts to get that déjà vu feeling as they start to notice conversations, opportunities, purchasing opportunities, unexpected gifts that match their Success Script! 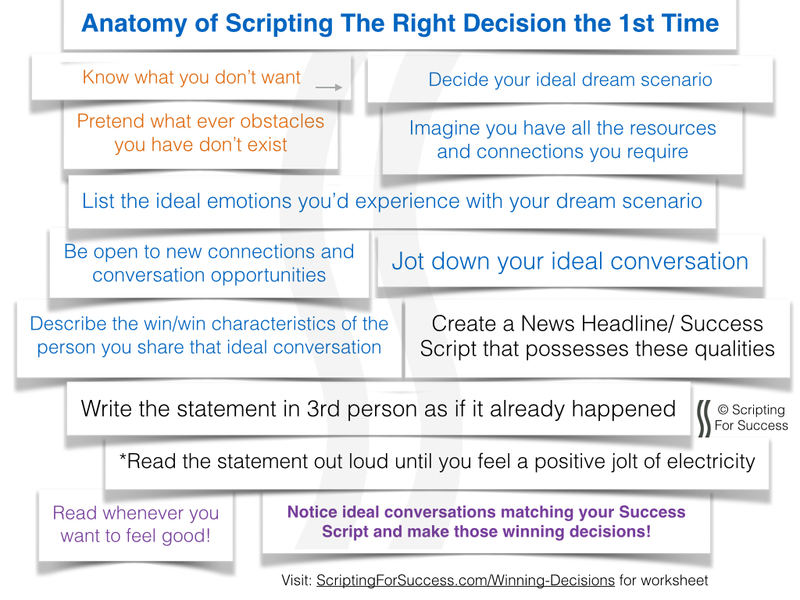 Scripting For Success is a planning process and damage control tool for business leaders that helps to quickly focus on ideal outcomes and quantum leap over pending relationship, legal and financial challenges, by shifting one’s focus on what’s already positive, productive and desirable instead of the current or pending gloom and doom. Scripting For Success helps to eliminate the tedious guess work of vetting prospective business partners by using planning tools to prepare for and guide ideal conversations, partnerships and outcomes and recognize win/win deals or time wasters, very quickly, during a meeting while saving decision makers and companies precious time, money and resources by swiftly avoiding missed opportunities or bad hiring, buying or partnering decisions. Thirty minutes “Jump Start Your Remarkable Legacy Now” strategy session. And you’ll leave the session renewed, reenergized and inspired to finally fully step into your leadership role in your life, company and community. © 2009 Scripting For Success. Website developed by Immersion Technology Inc.